Where do I use my Direct Fireplaces voucher code? Direct Fireplaces sell a selection of fires, fireplaces and fireplace accessories both online and via their showroom. Online you’ll find many of their fireplaces at discounted rates, allowing you to keep your home warm and stylish with stunning fire pieces, without spending a fortune. Discover fireplaces, fires, cast iron fireplaces, fire baskets and grates, hearths and back panels, accessories, stoves and outdoor ovens from top brands in the industry like Crystal Fires, Carron, Dimplex, The Penmen Collection, Be Modern, Axon Fires and Fireplaces and many more. Discover fireplaces in all manner of styles and materials including limestone, marble, black granite, wood and slate. Buy your fireplaces and surrounds separately or as a package and choose from traditional gas fires or more contemporary modern fires that can be wall mounted or placed on a hearth. Direct Fireplaces not only supply all manner of fireplaces and accessories, they also provide loads of helpful information to help you select your fire and set it up. Discover interior design advice, fireplace news and articles as well as a variety of buying guides, all of which will help you choose your fire based on your budget, demands, room size and preferred style. Learn about all the crucial details you need to know before you buy your fireplace and make sure you make the right choice before purchasing your new fire piece. If you’re shopping on a budget you can always check out the special offers section where you’ll find loads of discounted fires and deals on many fire accessories. As well as an array of fires, Direct Fireplaces also sell outdoor ovens. There's nothing better than a BBQ in summer or the authentic taste of a homemade pizza. And with the quality outdoor ovens cooking range at Direct Fireplaces you can easily enjoy garden entertaining and delicious freshly cooked food. Choose from attractive wood-fired pizza ovens, stone masonry barbecues and steel barbeques all of which are affordably priced and come with free delivery, finance options and a price match promise. Browse through the outdoor ovens available at Direct Fireplaces and create a stunning piece in your garden where you and your family and friends can sit around during the summer months. Stay on trend and enjoy the character and charm of natural materials with the collection of fire surrounds at Direct Fireplaces. All of the surrounds available can be custom made to your individual specifications and choice of materials and have been carefully selected by an expert team who’ve picked only the best products from top leading brands in the fire industry. The fire surrounds at Direct Fireplaces are available in a range of materials including wood, agean limestone, marble and black granite. There’s also a great selection of cast iron fireplace mantels available too, so whether you are looking for something contemporary or want to create a more traditional atmosphere, you can find what you need. All of the fireplace mantels for sale come with free UK delivery and a price match promise, allowing you to save money while purchasing a stunning fire piece. If your home has traditional features such as tiled Victorian fire surrounds then choose a cast iron fire. Cast iron fires are great at complementing stunning period features throughout your home but can also suit more modern looking rooms when paired alongside arch inserts, making them a popular fire with many customers. At Direct Fireplaces you’re sure to find a cast iron fire surround that harmonises your living space perfectly- they offer decorative tiled inserts, combined cast iron fireplace surrounds, hob grates, and unfussy, slim-lined fascias. All these features are supplied from the best brands like Cast Tec, The Gallery Collection and Carron, so you can rest assured that you’re buying from only the best. Discover cast iron fireplace inserts for a real period look, tiled cast iron fire inserts to add some extra colour and design to your fireplace, cast iron fireplace combinations, perfect for bedrooms and to add a period style to your room and cast iron fire grates and fascias, all at a great price. Direct Fireplaces offer free delivery to all UK mainland addresses. In the unlikely event that you’re not 100% satisfied with your purchase and you want to return the goods, Direct Fireplaces offer all customers a 14 day no quibble refund. This will give you 14 working days in which to decide to keep the goods or to return them for a refund. 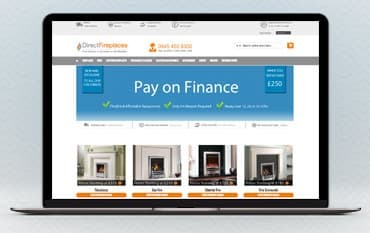 Direct Fireplaces is a specialist fireplace retailer, showcasing a stunning range of fireplaces and fireplace accessories both online and in their showroom. Whether your home is traditional or contemporary you'll find your perfect fireplace in Direct Fireplaces’ collection of limestone, wooden and marble fireplaces both in electric and gas options. Shop online for your fireplace with a Direct Fireplaces discount code from us and save money on your order. Whether you’re looking for traditional or contemporary fires, fire surrounds, fire packages, fire suits, or anything else, you can find it for less at Direct Fireplaces.